The rotator cuff is a group of muscles and tendons that attach to the bones of the shoulder joint, allowing the shoulder to move and keeping it stable. 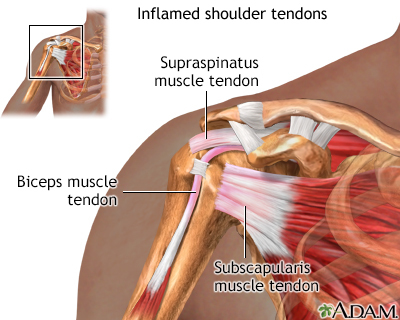 Rotator cuff tendinitis refers to irritation of these tendons and inflammation of the bursa (a normally smooth layer) lining these tendons. A rotator cuff tear occurs when one of the tendons is torn from the bone from overuse or injury. The shoulder joint is a ball and socket type joint. The top part of the arm bone (humerus) forms a joint with the shoulder blade (scapula). 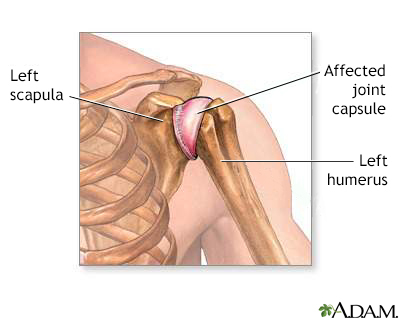 The rotator cuff holds the head of the humerus into the scapula. It also controls movement of the shoulder joint. The tendons of the rotator cuff pass underneath a bony area on their way to attaching the top part of the arm bone. When these tendons become inflamed, they can become more inflamed over this area during shoulder movements. Sometimes, a bone spur narrows the space even more. A sudden acute tear may happen when you fall on your arm while it is stretched out. Or, it can occur after a sudden, jerking motion when you try to lift something heavy. Early on, pain is mild and occurs with overhead activities and lifting your arm to the side. Activities include brushing your hair, reaching for objects on shelves, or playing an overhead sport. Pain is more likely in the front of the shoulder and may travel to the side of the arm. The pain always stops before the elbow. If the pain goes down the arm to the elbow and hand, this may indicate a pinched nerve in the neck. There may also be pain when you lower the shoulder from a raised position. Over time, there may be pain at rest or at night, such as when lying on the affected shoulder. You may have weakness and loss of motion when raising the arm above your head. Your shoulder can feel stiff with lifting or movement. It may become more difficult to place the arm behind your back. The pain with a sudden tear after a fall or injury is usually intense. Right after the injury, you will likely have weakness of the shoulder and arm. It may be hard to move your shoulder or raise your arm above the shoulder. You may also feel snapping when trying to move the arm. With a chronic tear, you often do not notice when it began. This is because symptoms of pain, weakness, and stiffness or loss of motion worsen slowly over time. Rotator cuff tendon tears often cause pain at night. The pain may even wake you. During the day, the pain is more tolerable, and usually only hurts with certain movements. Over time, the symptoms become much worse, and are not relieved by medicines, rest, or exercise. A physical examination may reveal tenderness over the shoulder. Pain may occur when the shoulder is raised overhead. There is often weakness of the shoulder when it is placed in certain positions. X-rays of the shoulder may show a bone spur or change in the position of the shoulder. It can also rule out other causes of shoulder pain, such as arthritis. An ultrasound test uses sound waves to create an image of the shoulder joint. It can show a tear in the rotator cuff. MRI of the shoulder may show swelling or a tear in the rotator cuff. With a joint x-ray (arthrogram), the provider injects contrast material (dye) into the shoulder joint. Then an x-ray, CT scan, or MRI scan is used to take a picture of it. Contrast is usually used when your provider suspects a small rotator cuff tear. Follow your provider's instructions on how to take care of your rotator cuff problem at home. Doing so can help relieve your symptoms so that you can return to sports or other activities. 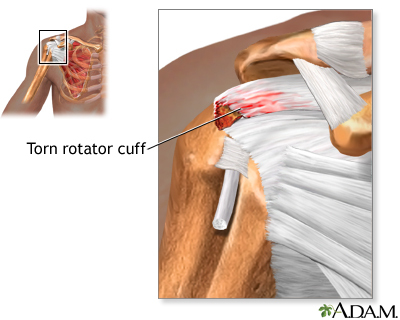 Surgery to repair the tendon may be needed if the rotator cuff has a complete tear. Surgery may also be needed if the symptoms do not get better with other treatment. Most of the time, arthroscopic surgery can be used. Large tears may need open surgery (surgery with a larger incision) to repair the torn tendon. With rotator cuff tendinitis, rest, exercise and other self-care measures often improve or even relieve symptoms. This may take weeks or months. Some people may need to change or reduce the amount of time they play certain sports to remain pain-free. With rotator cuff tears, treatment often relieves symptoms. But outcome depends on the size of the tear and how long the tear has been present, the person's age, and how active the person was before the injury. 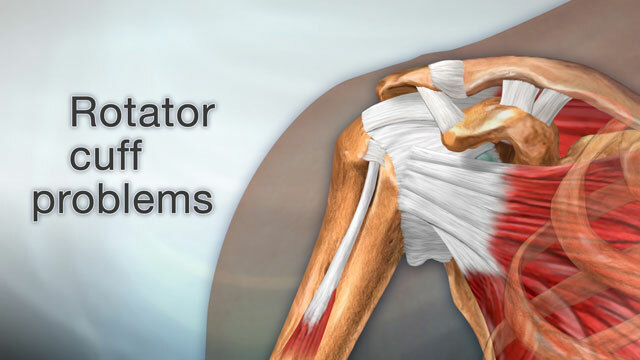 Call for an appointment with your provider if you have ongoing shoulder pain. Also call if symptoms do not improve with treatment. Avoid repetitive overhead movements. Exercises to strengthen shoulder and arm muscles can also help prevent rotator cuff problems. Practice good posture to keep your rotator cuff tendons and muscles in their right positions. Hsu JE, Gee AO, Lippitt SB, Matsen FA. 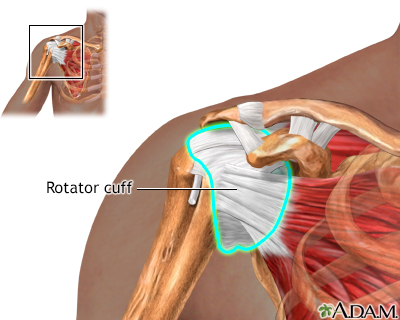 The rotator cuff. In: Rockwood CA, Matsen FA, Wirth MA, Lippitt SB, Fehringer EV, Sperling JW, eds. Rockwood and Matsen's The Shoulder. 5th ed. Philadelphia, PA: Elsevier; 2017:chap 14.